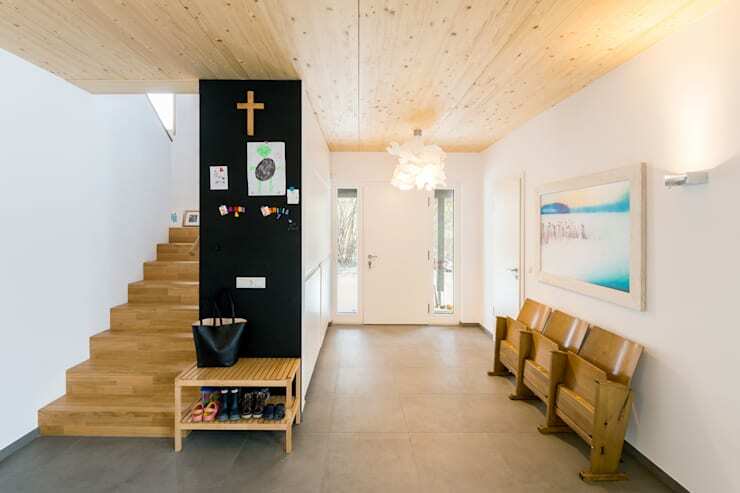 Sharp and stylish, this contemporary German home takes itself seriously. 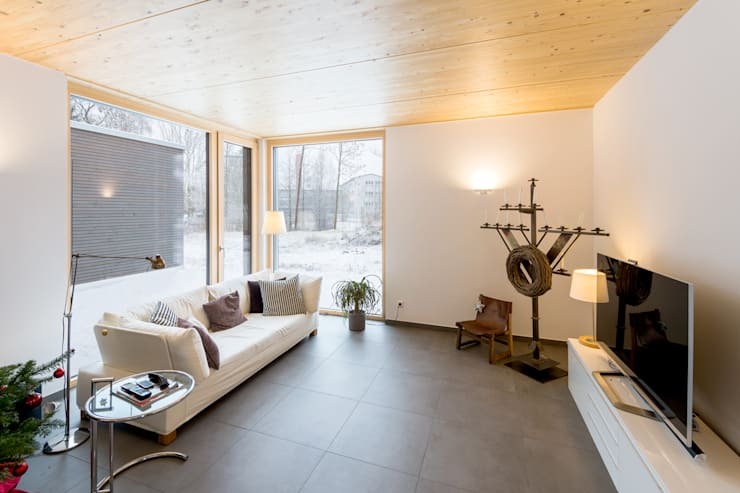 One of the many beautiful spaces captured by the photographer of SEBASTIAN KOLM ARCHITEKTURFOTOGRAFIE, this family home is an example of a crisp and refined environment that offers its inhabitants a refreshing, clean environment. With a focus on function rather than frills, you’ll find that the rooms of this home are refreshingly sparse, offering highly quality furniture and natural decor that’s surrounded by plenty of breathing room. 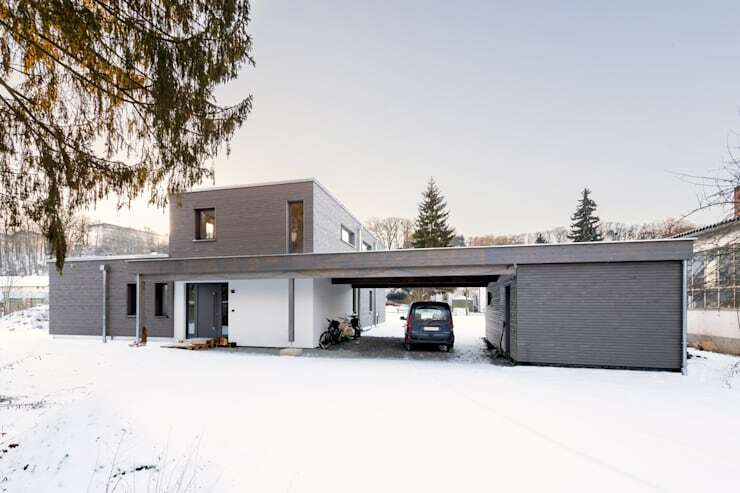 Striking against the freshly fallen snow, the silhouette of this home immediately identifies itself as a contemporary design with its flat roof and juxtaposition of glass and wood. 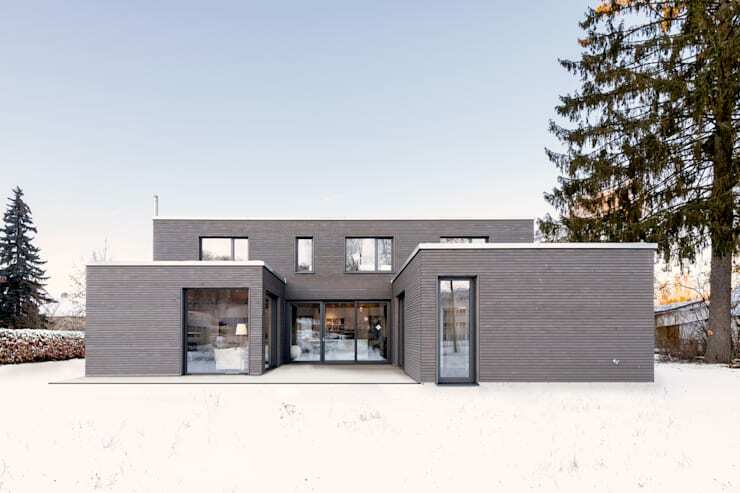 Especially beautiful against the pure white snow, the home’s grey cladding maintains a polished and down-to-Earth appearance, with a crisp silver lining wrapping around the upper edges of each volume. This side of the structure is cleverly designed to offer a sheltered patio, sandwiched between two side volumes. 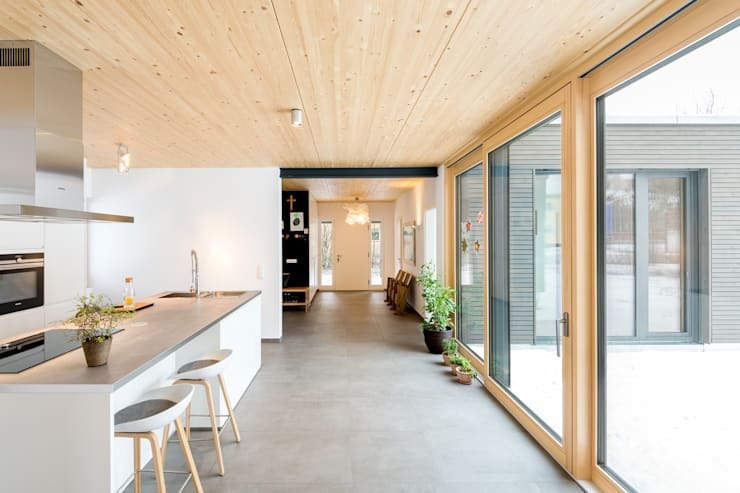 The house is designed with a detached garage, accessible via carport, making this an easy way for the family to maneuver multiple daily errands with ease. Throughout these interiors, you’ll find that the photographer has been able to capture the light and fresh essence that fills every room of the home. Light-hued wood comprises much of the trim, ceilings, and furniture, warming up the brilliant white walls. 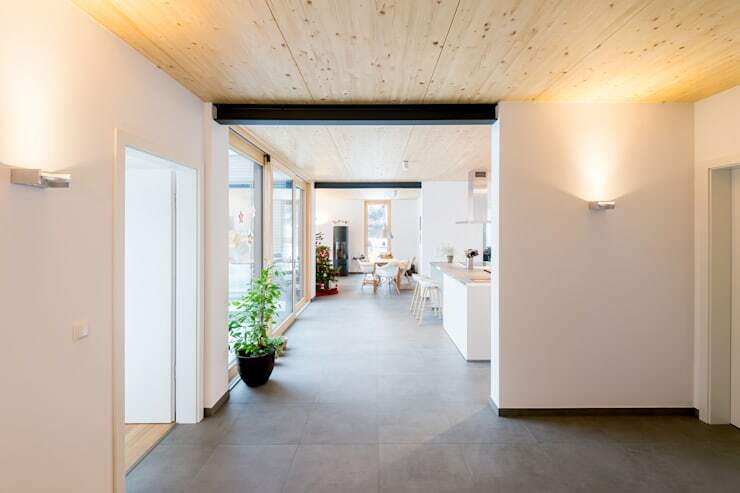 Much of the lower floor has been designed as a partially open concept home, with each room easily accessible through a wide connecting hall, with partitions offering a degree of separation between various functional rooms. The living room enjoys views across the backyard, in direct communication with both the sheltered patio and grey volume that sits opposite. An absence of linens (curtains, rug) allows the viewer to enjoy every last inch of the room’s surfaces, with sunlight reflecting effortlessly across the smooth walls and floor. Decorated for the winter holiday season, the room still keeps things fresh and light with the addition of plants, which have been placed strategically in most rooms of the home. Upon entering the home, a plain and uncluttered foyer provides a generous landing pad for groceries, sports equipment, coats, etc. A black panel offers a bold contrast, its crisp rectangular contour adding to the refined modern atmosphere of the space. Notable in this entryway is the trio of upcycled chairs that have made their way from an auditorium into the residence to serve as a convenient spot to sit while putting on shoes. 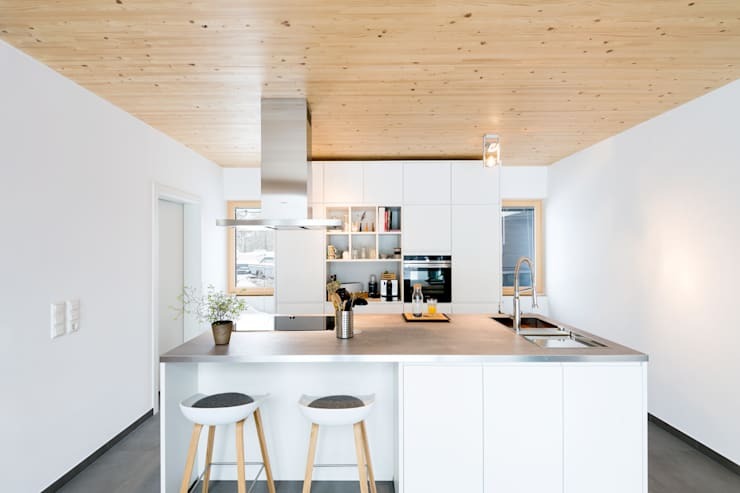 Absolutely immaculate, this white kitchen is undeniably a clean and efficient workspace. A friendly breakfast bar is defined by a pair of stools, with an L-shaped island providing a configuration that allows for various options when it comes to work, prep, clean-up, and play. A coffee bar fits in neatly among the cabinets and oven, a modern convenience whose compact size corresponds aptly to the dimensions of the room. In a prime location looking out over the patio, this kitchen offers a sunny and cheerful workspace year-round. In winter, plants and herbs enjoy their warm, window-side locations, and in summer, the large glass door slides aside to establish an open dialogue between the kitchen and the outdoors. Share your comments on this stunning example of contemporary architecture below!